A day with Aloka Bhikkhu, a Buddhist monk in the Tibetan tradition who will lead us in a day of meditation practice including insight and loving kindness meditation, as well as meditation in our daily life. 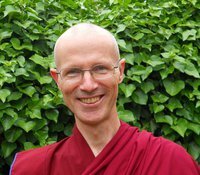 Aloka Bhikkhu is now a disciple of Ringu Tulku Rinpoche having completed many years of training in the Theravada Buddhist tradition. This entry was posted on September 27, 2010 at 8:59 pm and is filed under Teachings. You can follow any responses to this entry through the RSS 2.0 feed. You can leave a response, or trackback from your own site.